Five years ago, I purchased The New Best Recipe from America’s Test Kitchen (AFK). 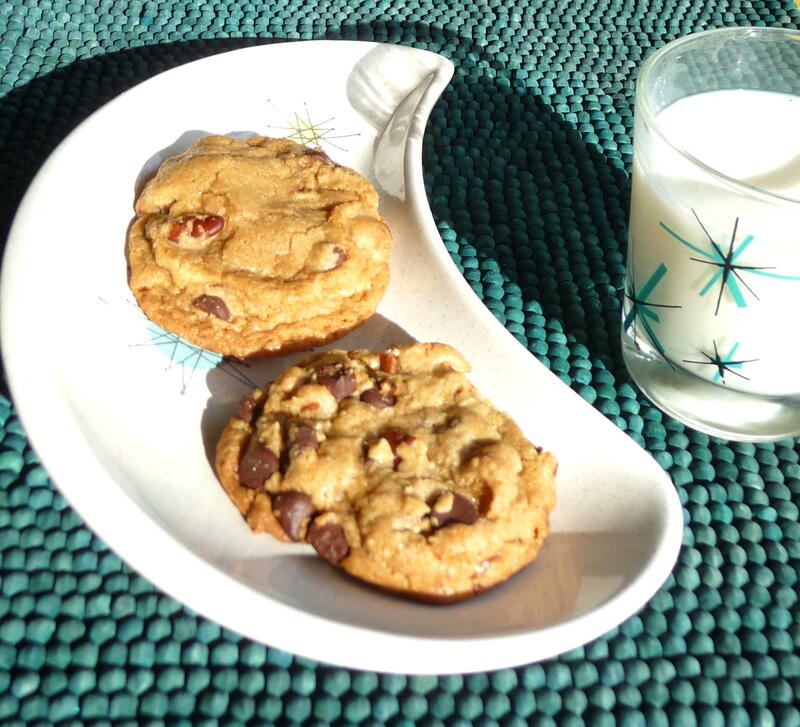 One of the first recipes I tried was the “thick and chewy chocolate chip cookie”. Finally, I was able to attain my long-desired state of chocolate- chip nirvana at home. The ATK recipe is precise and scientifically tested. ATK tested the various permutations of this genre and found the very best combination. As with some of their recipes, not every pain-staking step is absolutely necessary (see below). This cookie achieves its texture from melted butter (as opposed to creamed room-temperature in most recipes), more brown sugar than white (two-to-one), and an extra egg yolk. Careful attention to baking time is vital, i.e., a slightly underbaked cookie is actually done, while one looking “done” is probably over-baked. I have two comments about the ATK recipe. First, I used dark-brown sugar for more depth of taste; light-brown sugar is an option, but it would be a paler and a bit less flavourful – so, why use it? Second, the “jagged-edge” technique is good for appearance and not terribly time-consuming; nonetheless, it can be skipped with no loss in the cookie’s interior texture – see the first photo for the difference in the smooth dough ball (top) and the jagged-edge variety for contrast in appearance. I think this technique is more a subjective matter for the cookie’s appearance. You need not seek perfection any longer. 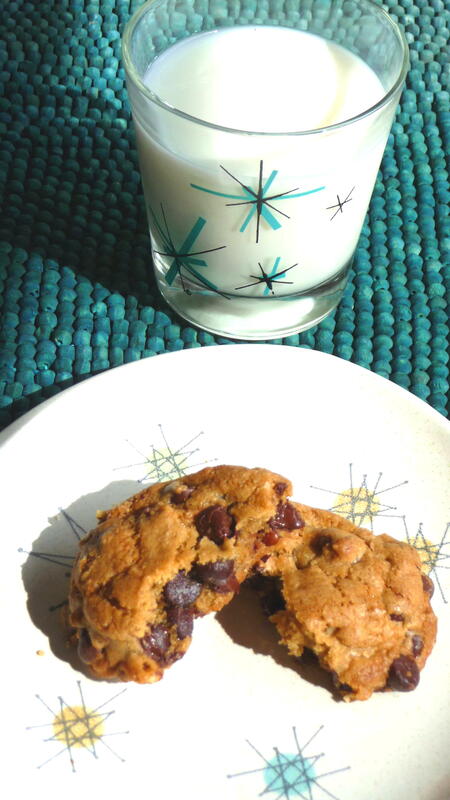 To make your chocolate-chip cookie dreams come true, give the ATK recipe a try. It is the ultimate in this most important of dessert genres. Whether in the 1950s or today, this is a perfect afternoon snack. Makes about 18-24 large cookies. These oversized cookies are chewy and thick, like many of the chocolate chip cookies sold in gourmet shops and cookie stores. They rely on melted butter and an extra egg yolk to keep their texture soft. These cookies are best served warm from the oven but will retain their texture even when cooled. To ensure the proper texture, cool the cookies on the baking sheet. Oversized baking sheets allow you to get all the dough into the oven at one time. If you’re using smaller baking sheets, put fewer cookies on each sheet and bake them in batches. 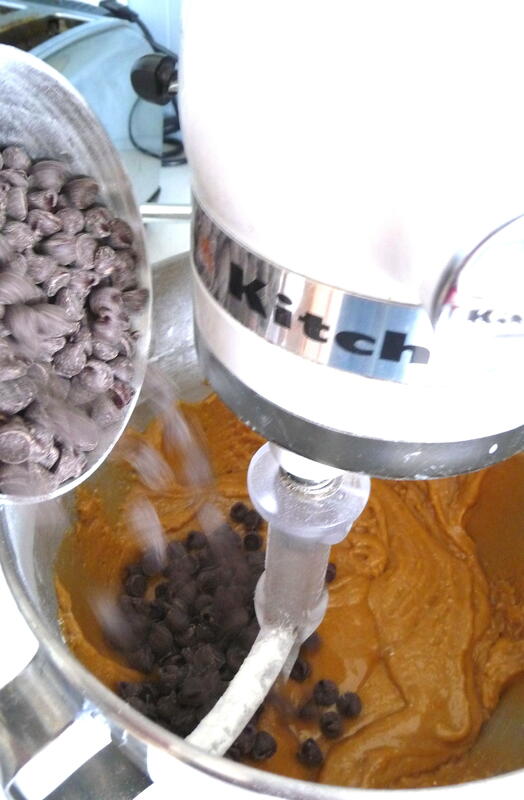 Plenty of chocolate chips mix into a soft wet dough. 1. Adjust the oven racks to the upper- and lower-middle positions and heat the oven to 325 degrees. Line 2 large baking sheets with parchment paper or spray them with nonstick cooking spray or use a non-stick silicon mat, e.g., Silpat. 3. Either by hand or with an electric mixer, mix the butter and sugars until thoroughly blended. Beat in the egg, yolk, and vanilla until combined. Add the dry ingredients and beat at low-speed just until combined. Stir in the chips to taste. 4. Roll a golf-ball size of the dough into a ball (or use a two-tablespoon ice cream scoop), for standard-sized cookies, or use a scant 1/4 cup amount of dough for larger cookies. Hold the dough ball with the fingertips of both hands and pull into 2 equal halves. Rotate the halves 90 degrees and, with jagged surfaces facing up, join the halves together at their base, again forming a single ball, being careful not to smooth the dough’s uneven surface. Place the formed dough balls on the prepared baking sheets, jagged surface up, spacing them 2 1/2 inches apart. 5. Bake until the cookies are light golden grown and the outer edges start to harden yet the centers are still soft and puffy (and look a little bit wet in the middle), 15 to 18 minutes, rotating the baking sheets front to back and top to bottom halfway through the baking time. Cool the cookies on the sheets. Remove the cooled cookies from the baking sheets with a spatula. This entry was posted in Baking, Cookies, Dessert, Recipes Misc and tagged Chewy, Chocolate, Chocolate Chip, Cookie. Bookmark the permalink. Hi, Thank you for sharing this recipe. I would really love to try this, because hubby is a chocolate chip cookie-holic. Chocolate chip cookies are always irresistible! Guys who can cook are charming! I’m impressed :=) Your cookies look so good! Dan, I love these cookies, and Cooks Illustrated! Great post. Thanks for the feedback, Theresa. I do appreciate your nice comment! Anyway, I since I can’t find an email link on your site, I’ll just leave the message here. “Hey – don’t go to Kristi Rimkus’ blog – there’s an active threat onher site. I and Biren from roti n rice got warnings when we went there this evening. Don’t know if you know but a few people have already lost their blogs because someone is maliciously and randomly planting viruses on blogs. Silvia Gregori from Citron et Vanille is one of the victims. Dan was kind enough to bring over these wonderful cookies and a pick axe. Didn’t have to use the pick axe, cookies as he said…so good. My favourite combo. The pick axe…a loan for use on our common rocky isle. Hey Dan, these photos depict how you describe the cookie, which I appreciate. I also like the food composition. I’m still working on food composition and styling-it frustrates me a bit. By the way, it does seem that America’s Test Kitchen has some seriously tried & true recipes. I watch the show sometimes and have used the recipes. By the way, the problem that the Kitchen Masochist Girl/Lady is speaking of is real and is spreading quickly. Be Careful! so glad you made these. i’m in dire need of a great chocolate chip recipe that is moist and chewy! Thank you, Margot, for visiting. Hi, Irene. I appreciate your comment and technique advice. The flat middle sounds like a good solution to the uncooked issue. I agree that is simply a great recipe. Really delicious cookie, Dan! I used a fresh whole vanilla bean and hazelnuts as substitutions and they both worked really well. I also didn’t realize the butter was meant to be melted and creamed the butter with the sugar instead. I still experienced amazing results. Thanks for giving me my new go-to CC cookie recipe! I just made these… Uhhh-mazing! 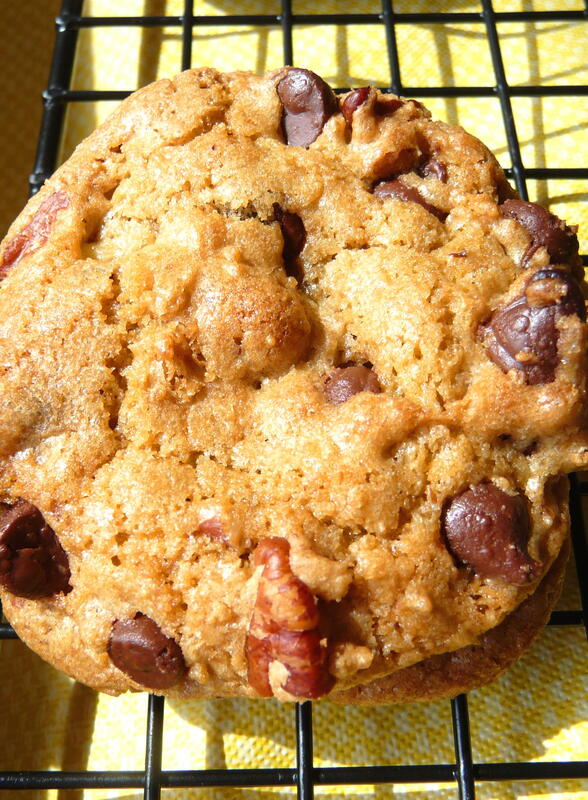 Just like you, I have been in search of the ultimate thick and chewy chocolate chip cookie and this, my friend, is it! Thanks so much for the recipe! I have the cookbook this recipe came in. Its amazing! Best chocolate chip cookie recipe out there. These will not deflate while they’re cooling like all the others I have tried. I used a little bit more salt and half light brown sugar and half dark brown sugar. Did not use nuts because my kids hate them. I also prefer chocolate chunks over chocolate chips. AMAZING!!! OMG………these are the BEST chocolate chip cookies I have ever tasted! Thanks so very much……for years I have searched for CHEWY cookies that are like these……..Just AMAZING!!!!! you can travel all around the world and also get paid to do it. of space exploration and travel based on cost.